Implications of external effects on business models have to be simulated holistically, i.e. by combining four key areas of bank management: profit and loss account (P&L), balance sheet, capital and liquidity – overcoming the popular “thinking in silos”, where—for example—one department is responsible for optimizing the balance sheet, another for optimizing profitability and yet another for optimizing capital. zeb developed a simulation model—zeb.future.grip—that models dependencies between these aspects. This makes integrated calculations of key performance indicators and of the main required regulatory measures possible, based on different scenarios and aggregation levels. The overall approach that was applied here is to some degree a paradigm shift. While most other analyses only simulate the outcome for banks, e.g. the projected development of the return on equity or the capital ratios, our approach in this study simulates detailed input factors and their development and calculates the resulting key performance indicators and regulatory constraints on this basis. This allows for a much closer look at each factor and, most importantly, provides a clear explanation of why, for example, profitability or capital ratios will go up or down in the future. From our experiences, such an illustration of correlations and explanation of backgrounds is still missing for a large part of the banking industry. 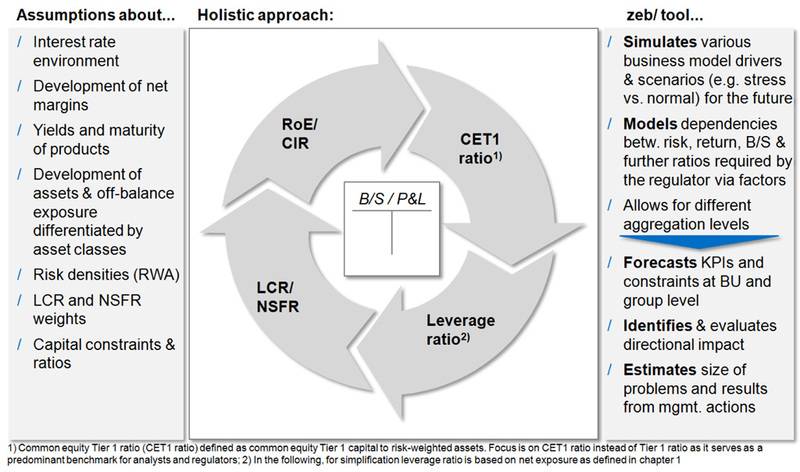 At present, most banks are not able to explain the combined overall impacts of a loan book increase on the B/S, the P&L, the capital ratios and the liquidity side altogether.This is what a holistic approach does. Figure 1 illustrates this and provides an overview of the general concept of our simulation. Calculations are based on a specific data set and on key assumptions that define the data framework and simulation environment. The data set contains publicly available information of each banking group in our European top-50 sample, e.g. comprehensive P&L and balance sheet data and detailed figures from the risk report and notes. Our assumptions cover not only general issues such as the yield environment or the development of margins, but also include detailed information on aspects like yields and maturities of products or balance sheet positions, the development of assets and off-balance exposure, risk weights of individual asset positions, or LCR and NSFR weights, for the purpose of modeling the important dependencies between P&L, B/S, capital and liquidity. We will provide an in-depth, nuanced analysis of the effects of low interest rates and regulatory changes on the business models of European banks as defined previously: retail banking, universal banking and wholesale commercial banking. Each analysis follows a three-step approach. First, the major issues and key points regarding the simulation are outlined for each business model. Second, the future development of key ratios and regulatory constraints for our three business models are estimated for the time until 2018 in a so-called baseline scenario. Starting with the figures for the financial year 2013, this scenario assumes that except for the impacts of depressed yields and regulation, all input parameters and variables will remain constant. This explicitly includes balance sheet volume and structure, margins and maturities of products, but also P&L positions other than interest income, e.g. commissions and fees, trading income or operational costs. The baseline scenario therefore provides a very clear yet isolated view on the consequences of our our “double trouble” in a “no management action” scenario. In a third step, the impacts of our external factors are analyzed based on specific management action scenarios that include possible countermeasures by banks like an improvement of sales activities, cost reduction programs, shifts in B/S structures (from low-yield to high-yield assets), an increase of total assets, or a change of the retained earnings rate. This approach combines external and managerial effects and therefore offers a very good assessment of which operational and strategic changes are necessary for banks to overcome the drastic effects of this new banking environment that is characterized by low interest rates and a new regulatory framework. Within each scenario, post-tax return on equity and cost-income ratio were used as major performance ratios, whereas the common equity Tier 1 (CET1) ratio, the leverage ratio and the LCR were used to reflect the regulatory perspective. In terms of business models, additional selected examples for specific sub-samples, e.g. internationally active retail banks, (German) retail institutions with a strong regional focus or international wholesale commercial banks, allow deeper insights into different strategic approaches within our general business clusters. From a retail banking perspective, the key point for a simulation of future developments is the dominance of interest income as the largest part of total earnings. On average, more than two thirds of the total income of retail banks is interest-related. Thus, the consequences of low interest rates are particularly severe for this business model. The retail business cluster consists of regionally focused banks from Southern Europe, the Nordic countries and Central Europe as well as larger, internationally active institutions and is therefore fairly heterogeneous. 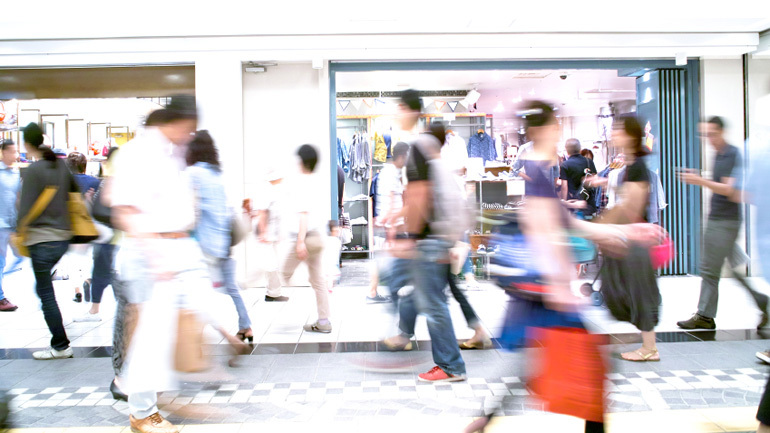 To provide a clearer picture of the actual impacts, this cluster is therefore divided into two sub-samples that represent the two “opposite poles” of the European retail business. The first sub-sample includes German retail banks, namely all primary institutions of the German savings and cooperative banking sector. These are relatively small, have a clear regional focus on only one mature market and show a very high dependence on interest income. Other specifics are the strong deposit surplus (as underlined by the loan-deposit ratio) and a large share of products with long-term fixed interest rates, e.g. mortgage loans. The second sub-sample includes international retail banks. These are considerably larger and operate in different, culturally diverse countries and regions, for example in the mature markets of Western Europe as well as in emerging markets of South America or central and eastern Europe. With a loan-deposit ratio of 114%, these banks are definitely more asset-driven and long-term fixed interest rates are not very common, as most products are based on floating rates. Reliance on interest income is clearly lower compared to German retail banks, with interest income representing 64% of their total income. Figure 2 outlines the fundamental differences of our two sub-samples. Thus, the impacts on the different sources of interest income are the key aspects in the simulation for retail banks. 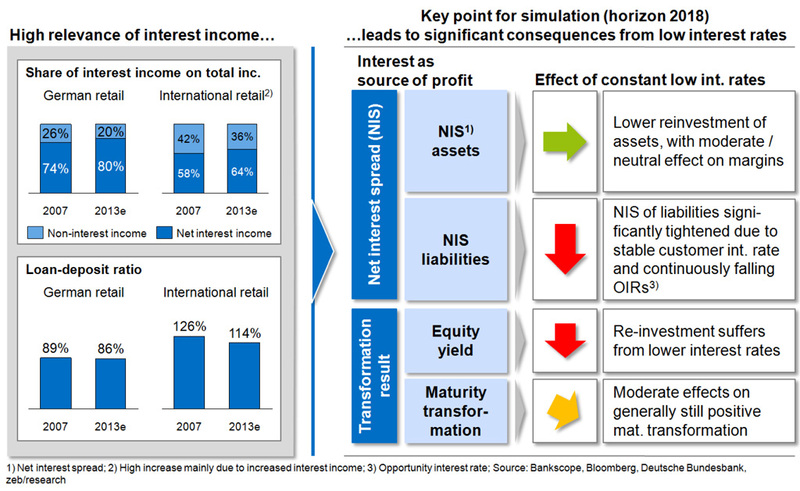 With regard to the net interest spread (NIS), low interest rates particularly affect the banks’ liability side. The high interest margins that were earned on customer deposits in the past will shrink in the wake of plummeting opportunity interest rates. Regarding the equity yield, existing investments with high yields expire bit by bit and can only be replaced by new investments with current low yields. Compared to these hefty consequences, the impacts on the net interest spread of assets or even on the maturity transformation are relatively low. 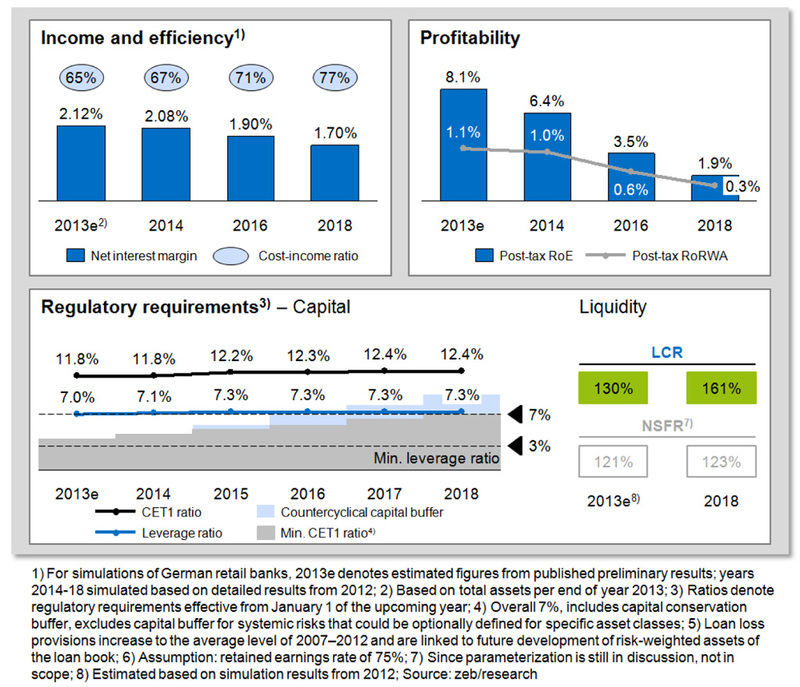 Looking at the estimated figures for 2013, German retail banks were in a good position, achieving a high profitability with a post-tax return on equity above 8%, an acceptable cost-income ratio and capital and liquidity ratios well above the regulatory requirements. However, until 2018, the low interest rate environment will drive the net interest margin down and a projected increase of the currently relatively low loan loss provisions to an average level will lead to a significant deterioration of the cost-income ratio and a drastic drop of the profitability to below 2% (post-tax RoE). Despite decreasing returns, German retail banks can retain enough earnings to offset the impacts from Basel III with higher and tighter capital ratios. However, we regard the overall impact of Basel III on German retail banks as rather minor, given the fact that capital deductions due to holdings, goodwill and deferred tax assets are moderate. Furthermore, most institutions use the standard credit risk approach rather than an internal rating-based approach, hence the risk-weights do not increase in the loan book. Overall, the capital base remains comfortable. 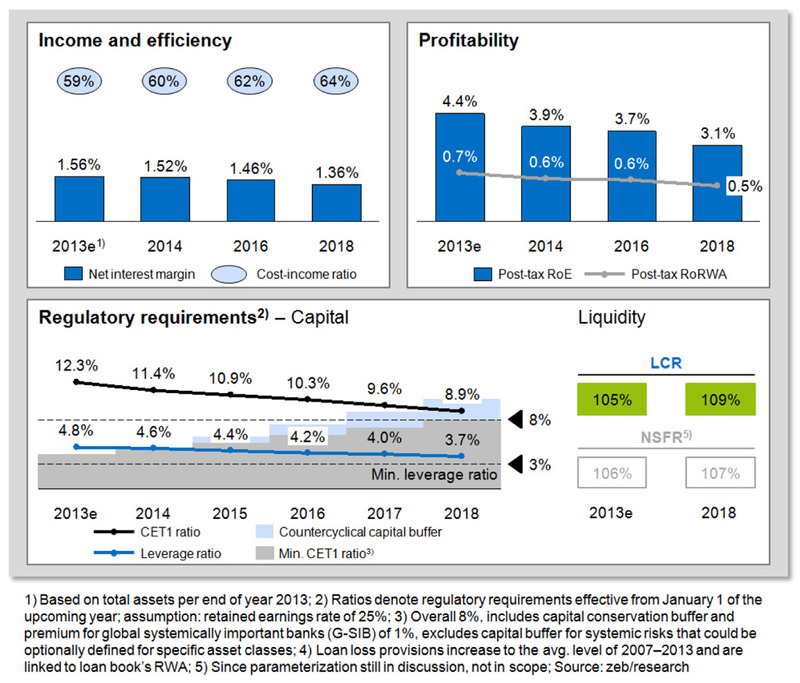 Second, a look at the baseline scenario for international retail banks: starting in 2013, the cost-income ratio was fairly good (59%) and the capitalization also reached a reasonable level with a CET1 ratio above 12% and a leverage ratio of 4.8%. However, with regard to profits, the current situation is not as comfortable. Large parts of the banks’ revenues were eaten up by high risk costs due to the trouble in the real economies of southern and eastern European countries. Overall, international retail institutions achieved a post-tax return on equity of only 4.4% in 2013—clearly a worse situation than for German retail banks. This lack of profitability and the structural differences between our two sub-samples are now decisive for the partly differing expectations with regard to the future development of international retail banks. Figure 4 provides a closer look at the results. In an environment of depressed yields, it does not come as a surprise that international retail banks will also have to deal with decreasing interest income and therefore with lower profits until 2018. The currently relatively low profitability will decrease even further, reaching a post-tax return on equity of only 3.1%. This decline of profits is slightly lower than one might expect, due to the lower reliance of this business model on interest income (see figure 2). Nevertheless, major differences compared to German retail banks become evident in the projected development of regulatory ratios. International retail banks face notably higher capital deductions—especially due to holdings and deferred tax assets—and a stronger increase of risk-weighted assets, because they have larger securities and derivatives portfolios which are particularly affected by higher risk weights in the new Basel III environment. As a consequence, common equity Tier 1 will decline significantly until 2018, but will ultimately remain above the critical level of approx. 8%. Although the leverage ratio is expected to be above the minimum requirement of 3% in 2018, capital is still a relevant constraint for future growth. Overall, institutions can hardly afford to simply accept these dramatic outlooks. German retail banks should at least slow down the decrease in profitability and maintain their current cost-income ratio level, whereas international retail institutions must fulfill the capital requirements by investors and analysts of approx. 10% in 2018. An improvement of their sub-standard profitability is also urgently necessary. The questions are: Which countermeasures and specific management actions are necessary to reach a certain, predetermined ambition level? Will retail banks only need some minor adjustments or rather a complete business model overhaul? To analyze these topics, a combination of different management actions, e.g. cost reductions and sales increases, were modeled. Ambition level and proposed management actions are presented below (figure 5). The defined measures include an increase of fees and commissions by 25% and an expansion of customer and corporate loans by 40% and 20% respectively by 2018. For German retail banks, a further annual growth of the balance sheet volume of 2% is assumed (roughly equals a capitalization of the interest earned on deposits). As the growth of international retail banks is limited by the leverage ratio, a cost reduction of 10% until 2018 is assumed. To fulfill investors’ and analysts’ capital requirements, the retained earnings rate will increase to 35% (from 25% at present). The question now is whether these hefty measures will be sufficient to achieve the ambition level. Figure 6 provides the answer. Our calculations show that, in principle, the overall ambition level is achievable by means of the suggested measures. 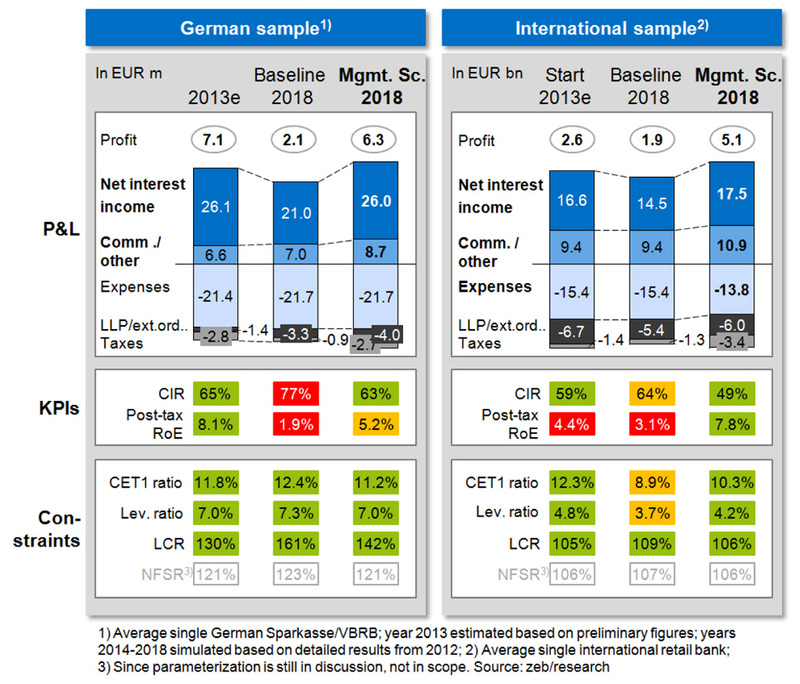 Cost-income targets are within reach and with regard to profitability, the profit decrease of German retail banks is slowed down, while the returns of international retail banks even increase. In addition, investors’ requirements will be met by 2018. However, these results can only be achieved by a combination of fairly substantial changes to the business setup. Individual adjustments are not sufficient. Instead, extensive changes and efforts are required to counteract the double burden of low interest rates and a changing regulatory environment. 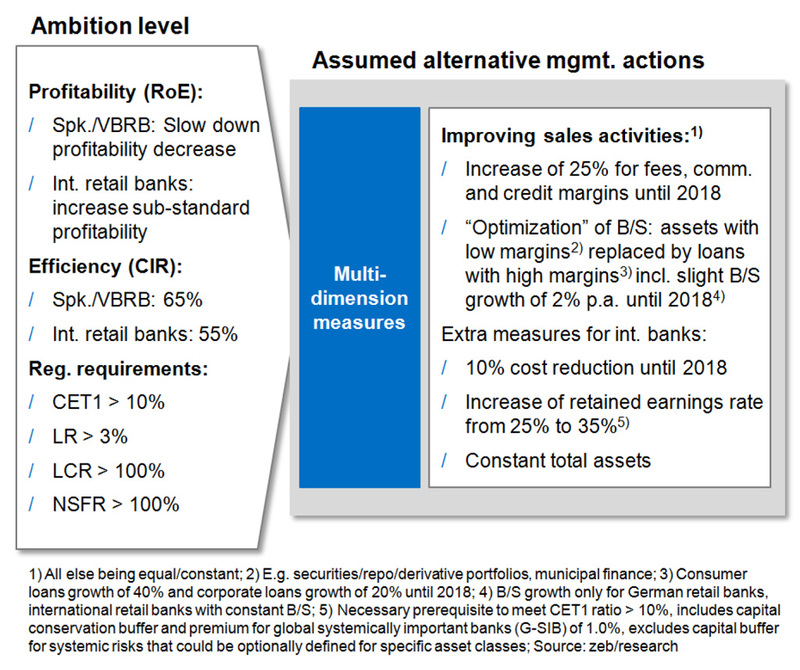 And even with these fundamental countermeasures, retail banks will still not achieve a reasonable profitability level. Post-tax returns on equity will continuously be well below 10% and therefore below the widely accepted long-term ambition level for banking profitability and the banks’ long-term average costs of equity (post tax). The total shareholder return will develop accordingly over the next years. To earn the costs of equity in the future, retail banks will have to make significant adjustments to their business model. To summarize our findings, the aura of the retail banking model as the banking sector’s “anchor of stability” will not persist in the future, due to significant profitability and resource constraints. The capital shortage in internationally active retail banks entails the need for further capital generation or de-risking. The leverage ratio is not yet problematic, but specific compositions of loan books might lead to constraints in individual cases. However, the pressure on operating leverage will increase. The close correlation of the yield curve and banking income necessitates a downsizing of infrastructure costs. Affected retail banks have to streamline their operating model with particular focus on cost drivers, i.e. IT infrastructure and branch network. With regard to value pockets or return sources, the severity of regulatory impacts differs significantly between individual product categories (e.g. mortgages vs. consumer loans). For each bank, individual detailed impact analyses are the key to optimizing their respective asset portfolios. On the whole, the retail banking business will also have to rethink its dependency on interest income. A shift towards other income sources (e.g. fee-based income) is clearly recommendable. The impact on the retail banking sector will be quite significant. The fundamental reliance on maturity transformation and deposit margins is no longer sustainable. In addition, a general market consolidation due to high fixed (regulatory) costs in the light of shrinking profitability can be expected. We also see an emergence of new supply chain solutions to improve the flexibility of the cost base, in particular with regard to operations (e.g. merging/off-shoring back office centers). Furthermore, new developments like digitalization will have an impact on the banks—a subject that will be addressed in a separate study.